To celebrate the 30th anniversary of its first light, the Canada-France-Hawaii Telescope releases a 370 Megapixel deep sky image with half a million galaxies, an exclusive illustrated essay on its past and current achievements, and new wallpapers of the telescope. The CFHT Legacy Survey Deep Field #1 image showcased here is the result of the accumulation of several hundreds of hours of light integration over five years (2003-2008) with the CFHT using the 340 Megapixel camera called MegaCam. This field and three other similar ones in other parts of the sky were systematically observed every three nights to detect faint supernovae going off in distant galaxies (up to 7 billion light-years away, about half-way the age of the Universe) in order to study the effect of the mysterious dark energy that is responsible for the accelerating expansion of the Universe observed today. 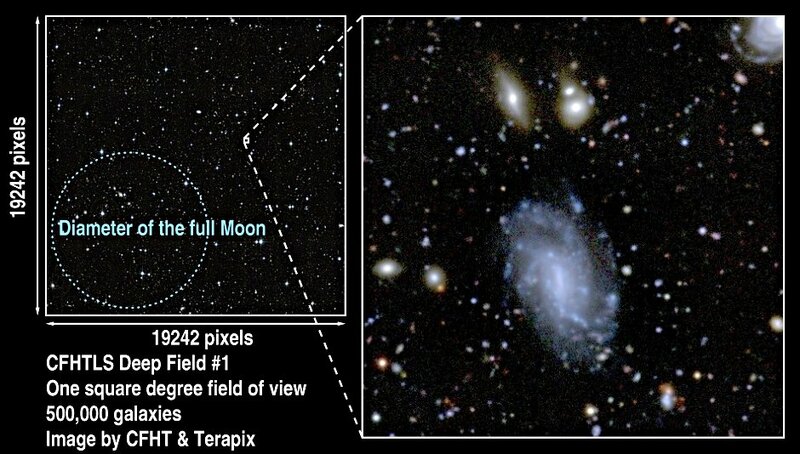 When stacking together all these individual MegaCam images gathered over the years, a dense wallpaper of distant galaxies is revealed (an observing technique called dithering allows to cover a larger field of view than that of the camera, leading to a sky coverage over 370 Megapixel seen here). While a few foreground stars from our own galaxy are present in the field, approximately half a million galaxies can be counted on the entire image. These ultra-deep images are then used to explore gravitational lensing effects induced by the large scale structure of the Universe as well as the most distant galaxies and quasars. When fully zoomed out, as represented on the left in the above illustration, the image does not look very exciting. But with a subset of the image of only 500x500 pixels shown at full resolution (on the right, above), a few large galaxies are easy to see: you can quickly count ten of them. Look more closely and you start seeing tens of small ones! If you were to count them all, you will end up with a couple hundred on this tiny fraction (0.07%) of the whole image. If you extrapolate to the full size of the image, you do indeed end up with nearly half a million galaxies! This image was produced by CFHT and the data processing center Terapix based in Paris (Institut d'Astrophysique de Paris) and is released as part of the public release (Nov. 14, 2009) to the worldwide scientific community of the Terapix CFHTLS T0005 release available at the Canadian Astronomy Data Centre. The CFHTLS T0005 release includes the vast majority of data gathered over the course of the CFHT Legacy Survey. The Terapix CFHTLS T0006 release offers for the first time the complete CFHTLS data set, it will be made available to the worldwide community in November 2010. As your screen is too small to display the whole image at full resolution, follow the link below to travel through space over this 1 degree by 1 degree field (four times the size of the full Moon). Enlarge your browser to the full size of your screen... and enjoy the trip! After viewing a creative and humorous Illustrated Essay made by David Gillette for the PBS affiliate Twin Cities Public Television following his visit to CFHT in Waimea and to Mauna Kea, CFHT decided to commission David for an illustrated essay describing CFHT's story over the past 30 years. Once established the main ideas CFHT wanted to communicate to the audience, David was given free rein to produce the final version, entitled "30 Years at the Top". Enjoy the show! CFHT's astronomer and photographer Jean-Charles Cuillandre took two new photographs of CFHT in September 2009 to celebrate CFHT's anniversary. They are available for download as wallpapers in various screen sizes. Select the one you want on the links below! The CFHT summit building (13,700 feet elevation) and the sea of clouds hovering 7,000 feet below. At a time this photograph was taken, the old weather tower had not yet been replaced by the new one hosting the Mauna Kea Atmospheric Monitor (MKAM). 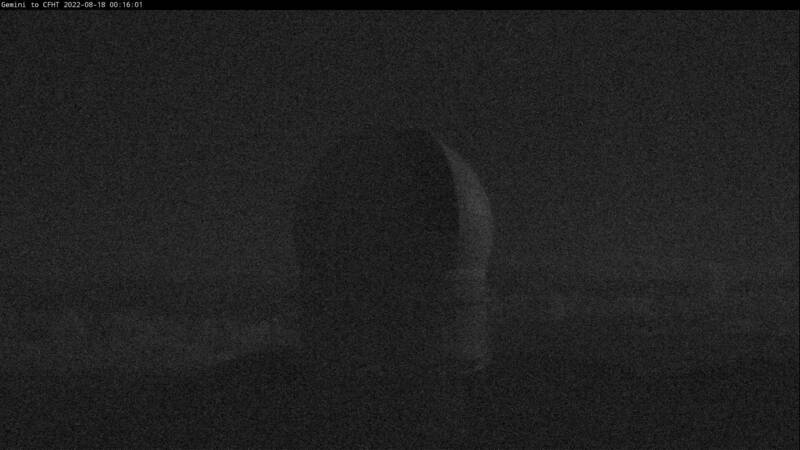 The MKAM tower can now be spotted on the CFHT summit webcam image. On top of the telescope structure is the old prime focus "cage", in which astronomers used to spend the night in the old days of photographic observations. The cage has been fully refurbished and is now hosting WIRCam, CFHT's wide-field infrared camera.